Oh, this book really got me; I haven’t read a book in a long time that drew the emotional response that The Light Between Oceans did. Perhaps it’s having an 11-month old baby that was very much wanted and difficult to conceive, but I could put myself in Isabel’s shoes and feel her pain like it was my own. Set in the late 1920s, the book follows a war hero and his young wife’s life on Janus Island, off the coast of WA. Tom is a lighthouse keeper trying to escape his memories of the war, and the pair lives on the island as its sole occupants. Longing for a family, Isabel suffers three miscarriages and is desperately lonely, when a little boat lands on Janus Island’s beaches, carrying in it a dead man and a crying infant. The tale that follows sees Isabel plead with Tom to pass off the baby as their own, she having suffered their third miscarriage just weeks earlier, with no one knowing what had happened. Tom struggles with this: it is his duty and legal obligation to report everything that happens on the island. However, he cannot bear to see his wife suffering, and so eventually agrees to raise the baby girl as their own. Three years later, while onshore in Isabel’s hometown in WA, Tom and Isabel make the discovery that Lucy’s mother – presumed drowned – is in fact alive, and mourning her missing baby. Thus begins the saga: what should Isabel and Tom do, what can they live with, and what is the best outcome for little Lucy? What a moral dilemma! I was torn between thinking that of course Lucy should be reunited with her mother, and feeling like maybe Isabel and Tom really were her parents; so much time had passed, their bond was deep and how cruel it would be to tear a four-year old girl from the only people she knows and loves. Such a beautifully written book, The Light Between Oceans really makes you question what is right and wrong, and all the shades that exist in between. At the end of this book, I lay sobbing into my pillow, looking at the baby monitor beside my bed at my sleeping baby and feeling so profoundly grateful that I have not been dealt such a miserable hand. The magic in reading, for me, is being transported to places you could never imagine, getting wrapped up in lives you wouldn’t think to dream up, and feeling deeply moved through books. 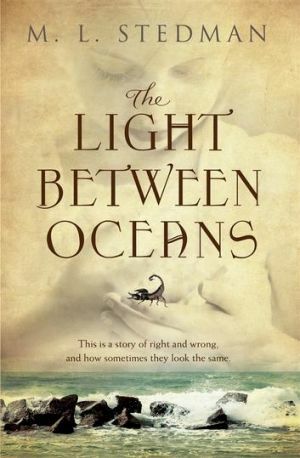 The Light Between Oceans, I have no doubt, will stay with me forever; so powerful its effect has been on me. I wholeheartedly loved reading this book and I appreciate the questions it made me ask myself. I highly recommend adding this to your reading list!